Some of the staff here at The Escapist have a big presence on the forums, and we try to communicate with you guys as much as possible about our content and the direction of the website as a whole. We realized, however, that there might be some questions burning a hole in your mind, that there might be some nugget of information about The Escapist that you've always wanted to know but didn't have a way to ask. A few weeks ago, in preparation for the anniversary of our fifth year of existence, we decided to provide that outlet. Audience members could log in to formspring.me and ask any question that they wanted. We circulated those questions to the staff, including some of the office denizens that may not have such a big presence on the site but who are vital to making The Escapist work. We compiled the best of their answers for your viewing pleasure. If the user supplied their profile, then we made sure to mention it, but otherwise the questions were asked anonymously. Get ready for a bumpy ride. This is the true story when people stop being polite and start being real. The Escapist, Durham, NC. Will you ever go print? I prefer reading online but it would be very fun to collect the articles like I do with GI. Russ Pitts, Editor-in-Chief: We've always looked toward the future of media with everything we do at The Escapist. So when we were founded, in 2005, we could see the writing on the wall that print was on its way out as a viable medium, incapable of supporting the kind of company we wanted to be. So for us, going online just made sense, and still makes sense. Yet we, too, would like to see our articles in print in some way, shape or form. It will never be our primary way of making a buck, but it's something we're seriously looking at. What does the future of Warcry look like? And will Themis Media be starting any other endeavors? 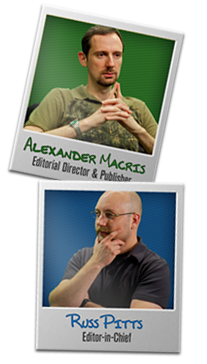 Alex Macris, Publisher and CEO (Archon): As my spiritual teacher, Master Yoda, once said: "Difficult to see. Always in motion is the future." Susan Arendt, Senior Editor: July 2011. Be there or be square! Susan Arendt: Why are you so obsessed with ponies? And how did the obsession start? Susan Arendt, Senior Editor: The obsession isn't pony-specific. I'm a lover of all things cute, and start my day with my Cute Overload email and calendar. I like kittens, puppies, ducks, hedgehogs ... if it's anerable (cute-speak for "adorable"), I'm fond of it. The pony thing grew out of a thread in which one member of our community made a joke about "Susan reviewing all the pony games." I asked our artist, Carrie, who actually is obsessed with ponies, if she could make me a special badge and she said yes, on one condition - that she could have it, too. And thus began our path toward poniosity. Carrie Keymel, Artist: Well, it takes time to train ninja ponies, they don't just appear. Or maybe they do ... they are ninjas after all. I'm not gonna outright say that we may be the cause of the Apocalypse in 2012, but just imagine a utopia where games are the number one source of entertainment and nerds finally rule all. It will be glorious and every person shall have a ninja pony of their very own (although hopefully at this point they will be Bionic Ninja Ponies with built in Nerf Gun attachments). Our probability machine gives us a .00000000000009 chance of this outcome. I think that's pretty decent odds. We are currently recruiting for our Cannon Fodder brigade, if you are interested.